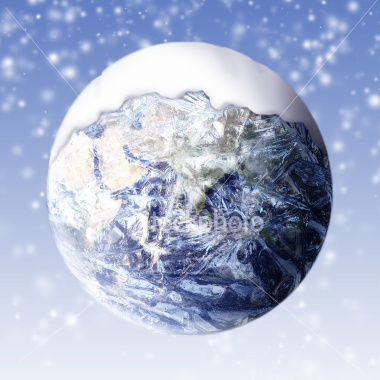 Summary: We have the first newspaper headlines announcing global cooling. Does this herald the news media yo-yo swinging from one extreme to another, after a few months in the middle? Here will look at the latest story, and show the rest of the story not told well by activists on either side. There is a sensible foundation for public policy action in here, somewhere. Let’s see if we can find it. All three quote climate scientists, who describe current research. Just like the pro-alarmist news media cites scientists about warming. Just as alarmists did about global cooling during the 1970s (see section 4b below). It’s the headlines, context, and exaggerated conclusions that mislead. The centerpiece of his article is this data, quite a shock to those expecting a rapid collapse of arctic sea ice extent from the 2012 lows. Those overconfident predictions were based on lightly-tested models and a short baseline of data (full coverage began only with satellites in 1979; see this page for a longer perspective — click its graph to enlarge). So America’s opinion on this vital issue goes up and down like a yo-yo, unable to make the public policy machinery run in a coherent manner. Unable to take even the easy obvious steps, such as better funding and supervision for climate research and massive funding to further develop alternative energy sources. An unnecessarily problem, in my opinion, as there are many scientists who provide clear and accurate guidance — and they run websites. Why is the news media coverage so unreliable? There are probably many reasons. One is that journalists get simple powerful stories from activists, who craft narratives by ignoring the parts that don’t fit. Activists give the brief, exciting, unqualified (ie, without qualifiers) quotes that make headlines. Too bad they are wrong far more often than the mild, nuanced, complex explanations of sober scientists. What are the key elements of the sea ice story? Journalists report each transit of the newly opened Northwest passage like it was Columbus reaching the New World. In fact that has been done by regular ships (including sailboats) many times in the 20th century. See “A List of the Full Transits of the Canadian Northwest Passage 1903 to 2006“, John MacFarlane, The Nauticapedia, last revised 2012. The Passage was probably clearer than the previous several centuries during the previous warm spell of the 1930s, but the Great Depression and WW2 discouraged scientists, commerce, and tourists from trying the voyage. 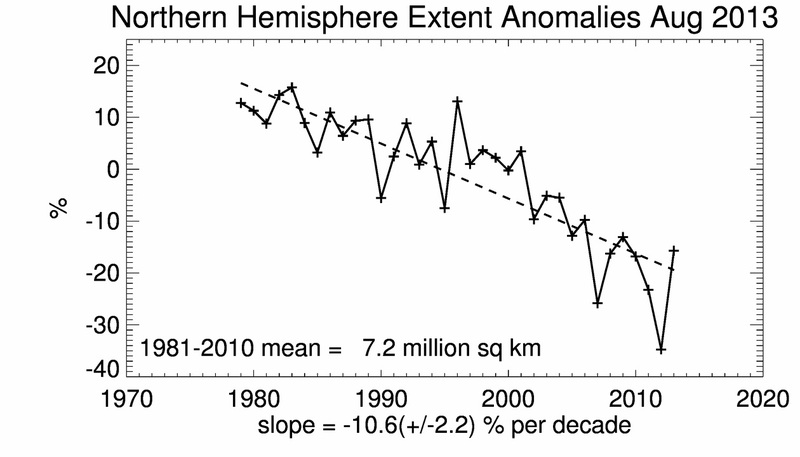 (2.2) The trend in the Arctic is still shrinking ice. Don’t get excited by short-term fluctuations. Note that the Antarctic sea ice pack is 2.5X the Arctic ice pack. 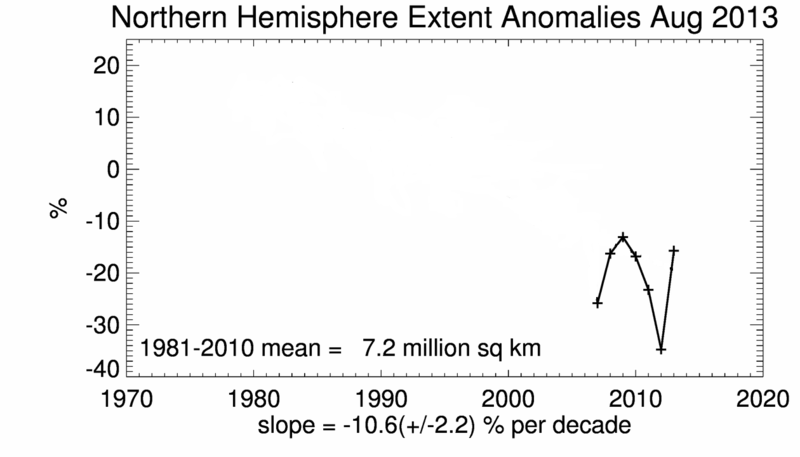 A graph of global sea ice area. 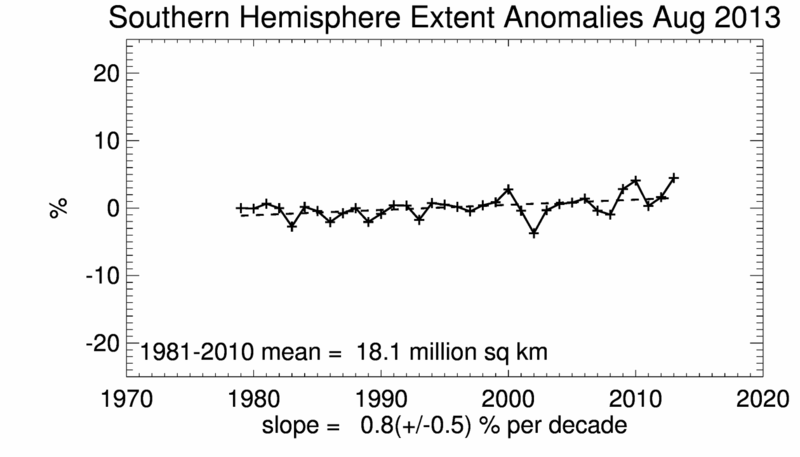 The red line is the anomaly, the variation from the 1979-2008 mean. From the website of the U of IL. Click to enlarge. The effects of soot and wind on Arctic ice are well known to climate scientists (although relative contributions remain uncertain), but have been well-hidden from the public. “Gas flaring and household stoves speed Arctic thaw“, International Institute for Applied Systems Analysis (IIASA), 10 September 2013 — About Stohl 2013 below. Sea ice has a bright surface, so much of the sunlight that strikes it is reflected back into space. As a result, areas covered by sea ice don’t absorb much solar energy, so temperatures in the polar regions remain relatively cool. If gradually warming temperatures melt sea ice over time, fewer bright surfaces are available to reflect sunlight back into space, more solar energy is absorbed at the surface, and temperatures rise further. This chain of events starts a cycle of warming and melting. 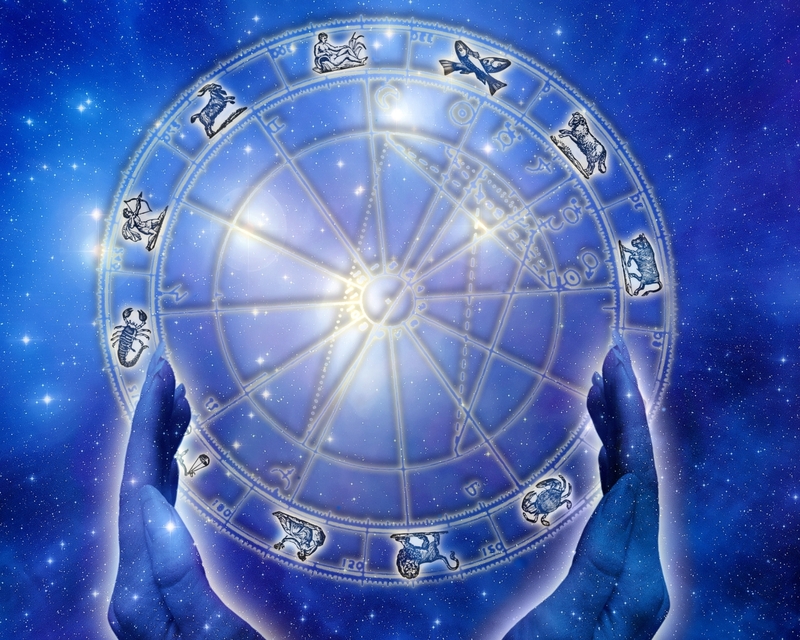 This cycle is temporarily halted when the dark days of the polar winter return, but it starts again in the following spring. Even a small increase in temperature can lead to greater warming over time, making the polar regions the most sensitive areas to climate change on Earth. … Sea ice differs between the Arctic and Antarctic, primarily because of their different geography. The Arctic is a semi-enclosed ocean, almost completely surrounded by land. As a result, the sea ice that forms in the Arctic is not as mobile as sea ice in the Antarctic. Although sea ice moves around the Arctic basin, it tends to stay in the cold Arctic waters. … So some Arctic sea ice remains through the summer and continues to grow the following autumn. Of the 15 million square kilometers (5.8 million square miles) of sea ice that exist during winter, on average, 7 million square kilometers (2.7 million square miles) remain at the end of the summer melt season. … The Antarctic is almost a geographic opposite of the Arctic, because Antarctica is a land mass surrounded by an ocean. The open ocean allows the forming sea ice to move more freely, resulting in higher drift speeds. … During the winter, up to 18 million square kilometers (6.9 million square miles) of ocean is covered by sea ice, but by the end of summer, only about 3 million square kilometers (1.1 million square miles) of sea ice remain. 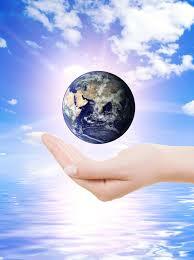 (3) A few of the key things to remember about global warming! The major global temperature measurement systems tell — broadly speaking — the same story since the 1970s: two decades of cooling, two of warming, followed by a pause. There is a debate about the attribution (causes) of past warming — which probably varied over time — between natural drivers (eg, rebound from the Little Ice Age, solar influences) and anthropogenic drivers (eg, CO2, aerosols, land use changes). The IPCC’s reports make few claims about attribution of climate activity, as this remains actively debated in the literature. “Atmospheric Aerosols: Increased Concentrations during the Last Decade”, James T. Peterson and Reid A. Bryson, Science, 4 October 1968 — Abstract only. “Present-day climate forcing and response from black carbon in snow“, Mark G. Flanner at al, Journal of Geophysical Research, June 2007 — Free copy here. “Climate change: Aerosols heat up“, Peter Pilewskie1, Nature, 2 August 2007 — Abstract only. “Cleaner air: Brightening the pollution perspective?”, Colin O’Dowd, 19th International Conference on Nucleation and Atmospheric Aerosols, June 2013 — Abstract only. Next Post Take the climate change quiz. How warm was August? What’s the trend? Benign raises a fascinating question about the influence of solar cycles on Earth’s climate. Here are some sources of information about this. Website of the Solar Cycle Progression Committee of the the NOAA/Space Weather Prediction Center — they have the original predictions for solar cycle 24 — and the actual results to date. The Solar Cycle Prediction page of David Hathaway of NASA, a forecast using the current data. Much of what’s written by laymen about this does not accurately reflect the state of knowledge. The Sun’s output was probably higher during the Maunder Minimum than today? Sunspots diminish the output of energy [they are darker and cooler]. With no sunspots there would not be a diminution of solar output. There are indictions of a historical relationship between the solar cycles and Earth’s climate, but so far no well-understood causual mechanism has been found. Nor is it yet clear if the sun is entering some sort of grand minimum (although this cycle might provide data allowing better forecasts). It’s on the edge of the known, and not much can yet be said. For more information see the solar sections of my posts about Science & Climate and Studies & Reports about Science & Climate. I don’t pay attention to activist websites run by non-climate scientists, from either side. I do not understand why you do, either. Let alone citing them as an authority, which strikes me as absurd. The IPCC and other major climate agencies have excellent websites (the source of the graphs shown here), with clear explanations of both climate dynamics and current research (they are the source of much of the info cited here) — done by real scientists. Also useful are the general science media, also cited here — such as Science Daily, Sci American, New Scientist. To over-generalize on the basis of scores of conversations about climate science on the FM website, people citing activist websites tend to have little understanding about climate change, because so much of what they know is not so (ie, is not supported by the peer-reviewed literature). Btw, that skeptical science post is delusional. Anyone saying that distinguished climate scientists don’t understand the difference between signal and noise is part of the problem — spewing misinformation. The is exactly the reason I suggest people following these things closely rely on either sites run by experts, or purely reporting websites (which is what we do here, in a small way). In fact the existence of the pause in global surface temperatures is now widely acknowledged by climate scientists (despite activists insisting otherwise until recently), and is a subject of much research into its causes and possible duration. The consensus theory of the ice ages is based on Milankovitch cycles of the earth’s tilt and wobble as it goes around the sun. See http://en.wikipedia.org/wiki/Milankovitch_cycles . Earth is “due” for a reglaciation within ~50K years, but anthropogenic factors could overwhelm the “orbital forcing.” However, reduced solar radiation over the next several decades seems fairly certain. Good point to remind us about the long-term cycles! (A) The ability of soar scientists to make accurate multi-decade forecasts is quite low. Look at the link I gave to the Solar Cycle Prediction Committee. At the start of the cycle they thought it would be more active than usual; in fact it was quite slow. Some got it right (eg, Leif Salvgarrd of Stanford), some were wrong (David Hathaway of NASA). (B) The variation in total solar irradiance from cycle to cycle is too small to have much effect on Earth’s climate. Which is why the indications of a strong solar influence remain a minority among climate scientists. There are other theories (eg, solar magnetic field affecting incidence of galactic cosmic “rays” hitting the atmosphere), but as yet they are quite speculative.